For most of the year, our boat Stingray, mainly takes divers out to various dive sites around Falmouth Bay. Sometimes it takes groups of people out for a wildlife watching trip, as a WiSe wildlife safe operator, we are recommended for this sort of activity. Once in a while we do survey work, towing a magnetometer or a side scan sonar tow-fish. 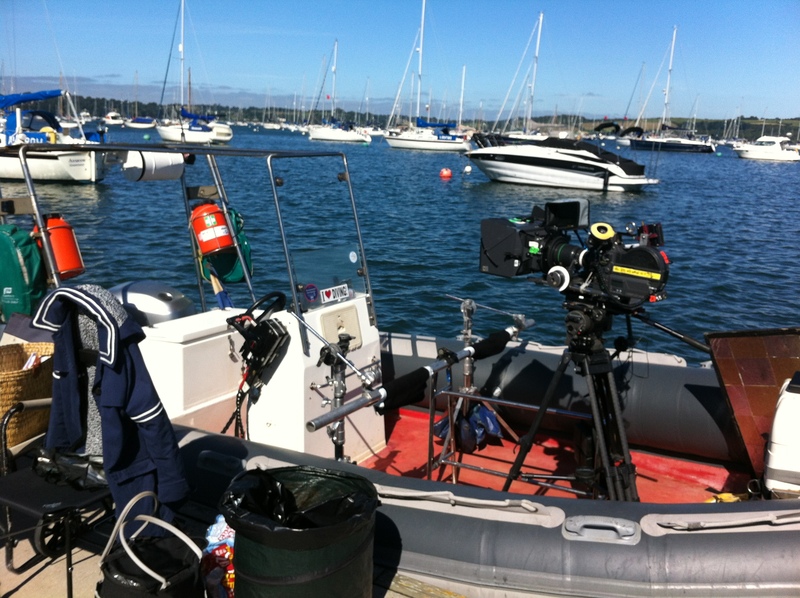 Our latest charter was as a safety boat for a German film crew. FFP New Media GmbH were filming their latest adaptation of one of Rosamunde Pilcher’s novels, “Evita’s Revenge” or “Evitas Rache”in German. The films appear on ZDF, a TV channel in Germany. These films of Picher’s novels are extremely popular in Germany. Rosamunde Pilcher was brought up in Cornwall, where most of her novels are based. She received a tourism award for her film’s adaptations, bringing tens of thousands of German nationals to Cornwall, to view the locations used in the films. 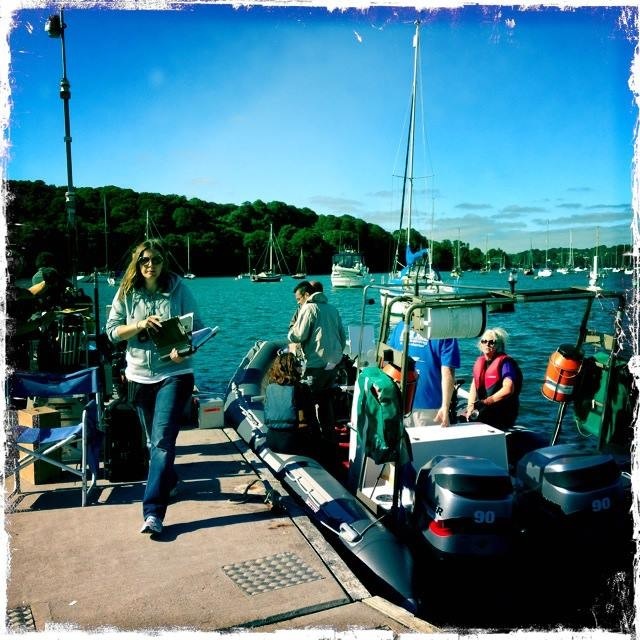 This film involved the use of a Riva Aquamarine boat, brought down from Fowey to Falmouth for a few days of filming. We were there for safety, to save the actors, should they fall out of the boat. We turned up at 7:30 for breakfast. At 8:00 we took some of the crew, presumably the director, producer and cameraman, out for a recce of the area. I asked what they wanted for a background, houses and hotels or cliffs? They wanted to see the cliffs first and settled on the area around St Anthony’s lighthouse. We had been told that only the safety divers/lifeguards were allowed to be on our boat, so a slight change already after taking the crew out. After returning, I was asked if we could take two of the cast out with a couple of the film crew. No problem, the boat is coded for ten plus two crew. It had been decided that Stingray was going to be used for the close up shots, it was at the right sort of height as the Riva, unlike Wave Chieftan, which is much higher. Whilst we waited, a scaffold pole and some stands were placed on board, creating a bench seat. Then the big camera, batteries, lighting, sound and the crew. I had to count the crew on to make sure we weren’t over loaded, we had to use Wave Chieftan as the safety boat as room was tight for the lifeguards on Stingray. We headed out, the camera was on the lead male actor, played by Francis Fulton-Smith. They said their lines, I accelerated on cue. We did it again, then again but just audio with the boat stationary. Once they were happy we went back to base. The camera position was changed and was now on the other character, played by Sam Carrack. We headed out and did the same sequence again. Back to base. The camera was moved to the Wave Chieftan, we now had the lifeguards on board. Out we headed, this time doing what we were contracted to do, staying in contact with the ‘star’ boat but not in shot, not always an easy thing to do. After a while we went back to base. They shot some footage on the quayside while we sat around and chatted. We were then taken for a catered lunch. The weather played ball, the morning was overcast and dull, in the afternoon the sun shone. It was like a different day, exactly what they wanted. The camera was back on my boat, with the two lead characters, Francis Fulton-Smith and Elizabeth Lanz. The same crew as before as well as another crew member. We went out in a similar routine as the morning, lines spoken twice, back to base, camera moved, back out, same again. All the equipment was then taken off of my boat and put on Wave Chieftan, we were back to being the safety boat. Out we went for some sunshine shooting with the two main characters in the star boat. The weather was glorious and the final scenes were shot as the sun was going down. Back to base. Everyone seemed happy. A 12 hour day, interesting and fun. Great to see how it’s all put together, handy for any other projects we may get involved with. The film was aired in March 2014. We can offer sightseeing trips around the area used during the filming of Evita’s Revenge, from our boat, which was used for the close up shots of the characters whilst on the water. Stingray is licensed to take 10 people out at a time for any sightseeing, wildlife watching or diving. We can offer special prices for large groups requiring multiple trips.